Sternal puncture (puncture sternum) - a method of extracting bone marrow. With the same objective can be puncturevine and the iliac bone, and infants tibial or heel bone. However sternum is the most convenient place for bone marrow puncture. Sternal puncture do at level II or III intercostal space, or at the handle of a special needle. In the USSR, use needle Cashiers. Sternal puncture with a needle Cashiers. The needle is in sternum (scheme). The needle is equipped with a movable flap that protects puncture internal records of the sternum and damage beyond the aorta. The install shield so that the needle, having a soft cloth that has progressed a 5 mm, While the end of it, punctures outer plate sternum, will be in the cavity of the latter (Fig.). Removing the rod, the needle attached 10 - or 20-gram syringe and produce suction 0.2 ml of bone marrow, which is poured on the hour or a glass slide. From the received punctate prepare smears that fix and paint like strokes blood. Sternal puncture is performed for the evaluation of the functional state of the bone marrow (in this case count in smears at least 500 of all nuclear items and display them percentages), and also for diagnostics of diseases of blood system, detect bone marrow metastases cancer, leyshmany etc. or for the use of bone marrow with the medical purpose (metallotherapy). Sternal puncture performed by a doctor. The role of the medical assistant (nurses) is to sterilize needles and syringes (by dry heat or boiling with the subsequent drying alcohol and ether), the preparation of the puncture site and laying on him sterile stickers after the puncture. Fig. 1. Normal bone marrow. Fig. 2 - 9. Bone marrow in various diseases. Fig. 2. Chronic thrombocytopenic purpura (disease Verligofa): 1 - functionally active the megakaryocytes. Fig. 3. Aplastic anemia. Fig. 4. Myeloma. Fig. 5. Metastasis of cancer in the bone marrow. Fig. 6. Gaucher disease: 1 - Gaucher cells (by S. L. Laskovoy). Fig. 7. Disease Chullera - Christian: 1 - xanthomatose cells (by S. L. Laskovoy). Fig. 8. 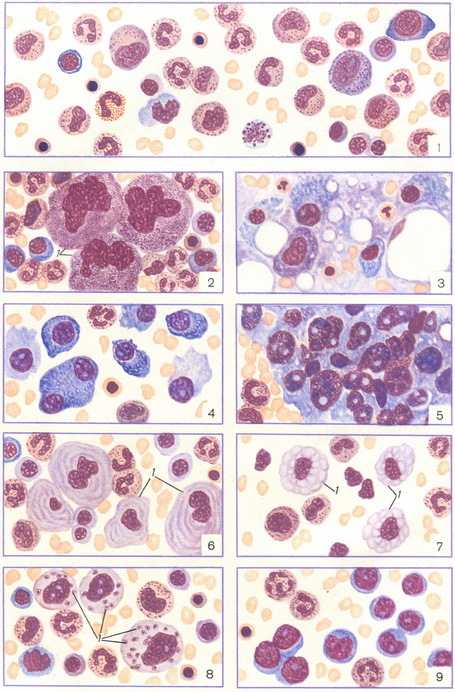 Visceral leishmaniasis: 1 - Leishmania in the cytoplasm of the reticular cells. Fig. 9. Acute leukemia.